A shoreline scene at Caye Caulker includes white sand beaches, a docked sailboat and palm trees. Wow, stepping off the airplane at Belize City recently was quite a pleasant jolt: instead of below-zero temperatures and fierce wind chills, we were greeted with a humid 80-degree temperature and a soft breeze. Instead of parkas, pacs and wool pants, people were wearing shorts, T-shirts and sandals. My wife, Carol, and I had been invited to vacation with our friends, Barbara Baker and Jon Sweet, on Caye Caulker, Belize. We eagerly accepted the invitation. Sweet had enticed me with reports of great fishing for bonefish, permit, tarpon and other saltwater fish species. Both Baker and Sweet mentioned the beauty of the area, tasty cuisine and the comfortable tropical temperatures. We hitched a water taxi ride to Caye Caulker and arrived after a 45-minute trip that ran past numerous cayes — small, sandy islands formed on coral reefs. After docking, we disembarked to a vista of white sand beaches, palm trees, brightly colored houses, brown pelicans and cormorants, and friendly street vendors offering fresh grilled chicken or fish. We hailed a cab and managed to wedge our luggage and ourselves into the sturdy golf cart. After a bumpy ride over dirt streets pocked with rain-filed holes, we arrived at our residence for the week — a quaintly painted cement structure that stood on 8-foot high supports. 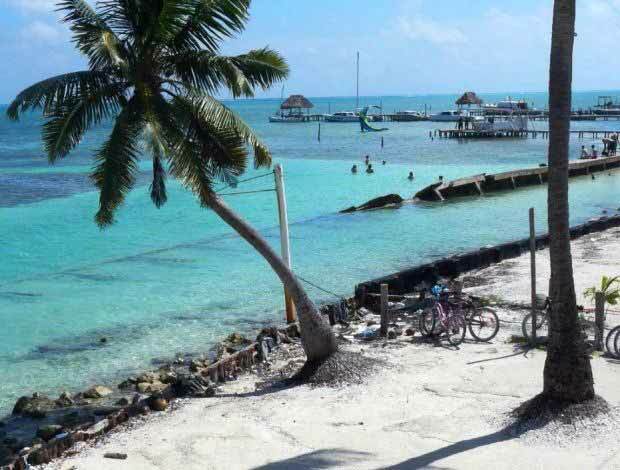 (Caye Caulker's highest point is only 3 feet above sea level). After a quick dinner that included grilled chicken, rice and beans and coleslaw, we slept. On Sunday we relaxed and recuperated from the 14-hour trip we had on Saturday. The early morning view from the house was astounding: great egrets, snowy egrets, white ibis, green herons, and yellow-crowned herons waded in a pond less than 50 yards away from the house. Sweet and I did manage to slip away for some wade fishing for bonefish on a flat no more than a half-mile away. Though we didn't connect on any bonefish, it was nice to wade in the warm waters and observe all the plants and animals nearby. Why, I even managed to catch a jack while blind casting. On Monday, Carol and I had the distinct pleasure of fishing with long-time Caye Caulker guide Eloy Badillo. Sweet had extolled the guiding prowess that Badillo possessed, but he couldn't have hyped the man enough. Badillo was pleasant, and we were at ease with him immediately. Badillo guided the sturdy boat to an area northeast of Caye Caulker. Soon, he cut the engine and picked up his pole — a sturdy 12-foot length of native wood — and pushed the boat along a flat. After 10 minutes, Badillo directed me to make a cast at a disturbance at 11 o'clock and 40 feet away. I managed to make the cast with my Echo Edge rod that was pretty much on the mark. After letting the squimp fly settle for a couple of seconds, I started to strip in line in 6-inch lengths. The bonefish cooperated and inhaled the fly causing me to do a short draw strike. The bonefish bolted for the open but I was able to turn it after a 20-foot run. In short order the 2-pound bonefish was boated and the skunk was out of the boat. It was now Carol's turn to fish. Badillo cranked the motor and sped to the lee side of Chapel Caye, a large island that had been developed as a world class golf course, complete with its own anchorage and landing strip. After slowly cruising the shoreline for a quarter mile or so, Badillo cut the engine and grabbed his pole. He spotted a mud — a murky area where feeding bonefish had muddied the water — and positioned the boat so Carol could make a downwind cast. Carol managed to make a 30-foot cast into the mud and let the squimp fly settle until Badillo told her, “strip, strip.” Carol had a take the first cast but failed to set the hook. On the third cast she managed to drive the hook home and, after a 30-second fight, land a bonefish that was about 14-inches long. It was her first bonefish, and she was ecstatic. Badillo and I exchanged fist bumps and urged Carol to continue. Within 15 minutes Carol hooked seven or eight bonefish and landed four more. It was a perfect morning in paradise and one that we will remember forever. The feisty bonefish, frigate birds overhead, warm breezes, coconut palms, white fluffy clouds and multicolored waters will be etched in our minds in perpetuity. There were many more adventures in our week's vacation. I'll try to describe them to you in next week's column. But for now I will tell you that you gotta Belize in a good time when you go to that country!